Home » Don’t Forget Your Holiday Card! Don’t Forget Your Holiday Card! It makes no difference if you will be spending the holidays with others or not. You should definitely send holiday cards to friends and relatives, and personalized ones help to fill the spaces that can often arise from distances and new social circumstances. If you don’t celebrate a particular holiday, a “New Year’s Day” card is a great way to stand out from the pack. Don’t think that you need to order hundreds of cards. Printing technology makes short runs (25 or so) economical for almost anyone. While it is on your mind, start a list of people who you will send a card to (if you can put it in a spreadsheet, you can keep it year to year and update and sort it easily). Include your accountant, lawyer, and any of the service professionals you encounter in your life in addition to family and friends. Remember that you can include the card with holiday gratuities (i.e., parking lot attendants, building staff, etc. ), so order more than you think you will need by about 10%. Remember to include postage costs in your budget and be aware that odd-size cards require a premium. And as part of the process, if you don’t want to order pre-printed envelopes that have your return address, you might want to think about labels or a stamper if you have more than 25 cards to address. We at Suddenly Solo heartily suggest you investigate a photo card. There are many different kinds of greeting cards that use photos. Some are just ‘frames’ that you insert a standard photo in, while others are one-sided photographs that include the greeting as part of the developing process. The thought is what counts, no matter what you type of card you choose. You don’t have to break the bank. No matter what version you choose, make it personal. Pictures of you doing something you enjoy – playing with a pet, on a vacation, or standing in front of the car you love to drive – will serve to paint a fuller picture of you and how you are doing for a recipient. Unless you are in a committed relationship, a picture of you alone is probably best. Order NOW for fast delivery and buy some nice stamps today. When they are delivered, don’t dawdle. If you have time, a brief “Thinking of you!” note would be a nice touch (with our handwriting, less is more!). 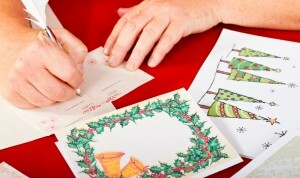 Use your list and start to address your cards as soon as possible and post them pronto. We promise that you will feel great when they are in the mail and that all those who receive them will feel love from you as well!